Though the Geneva-based company is well known for exquisite watches and timepieces, Chopard engagement rings are also extraordinary pieces with individualistic flair perfect for a bride-to-be who prefers to be a bit daring in her jewelry selections. First founded in 1860 by Louis-Ulysse Chopard, the company developed a stunning reputation for fine gold pocket watches with delicate mechanical intricacy. In time, that same attention to detail expanded to fine jewelry, including a unique range of engagement rings. Today, Chopard engagement rings are featured in hundreds of boutiques and authorized retailers throughout the world, and the name has become so synonymous with beauty and luxury that it has been featured in the media as well. Chopard timepieces and jewelry was on display with many celebrities during the 2006 Cannes Film Festival, and in the 2004 family film The Princess Diaries 2: Royal Engagement, the magnificent three carat cushion cut engagement ring was an authentic Chopard design. Geometric contemporary styles with oversized shapes and illusion-set floating diamonds. Solitaires in simple or pave settings with a variety of shapes, including heart, marquise, emerald, princess, and round cuts. A variety of settings including shaped bezels, flush settings, prongs, and channels. Unique designs featuring a floating diamond inset into a colored gemstone. 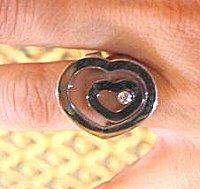 Signature "happy" rings with extensive use of metal suitable for engagement or right hand rings. 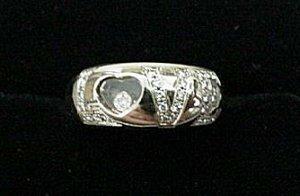 Signature "ice block" rings with thick metals and clustered diamonds in a variety of band widths for men or women. Many Chopard rings are reminiscent of art deco designs with their geometric patterns, extensive use of metal, and bold stylings, making them the perfect choice for a confident, bold engagement ring. In addition to stylish engagement rings, Chopard also creates other types of jewelry, including earrings, pendants, necklaces, and wedding bands to match their eclectic designs. These pieces are suitable for anniversary or other special occasion gifts, especially to match an elegant Chopard ring. 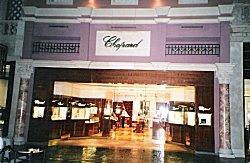 Chopard boutique in Las Vegas. Chopard watches, jewelry, and engagement rings are only available through authorized boutiques and dealers. Full Chopard branches (which also create rings) are located throughout the world, including Europe, the Caribbean, Asia, and the United States. Specialized boutiques can be found in even more locations, such as Egypt, Mexico, Kuwait, the Bahamas, China, Puerto Rico, and aboard the luxury ocean liner, the Queen Mary II. In the United States, Chopard boutiques can be found in New York, Las Vegas, Palm Beach, and other cities known for fine jewelry and exquisite taste. In addition to exclusive boutique locations, a list of independent authorized retailers can be found on the Chopard website.The cost of Chopard pieces varies greatly depending on the design, the total carat weight of the piece, and the quality of the stones, but in general the price of engagement rings begins at about $3,000. While that may exceed most couples' budget for a ring, couples that do splurge on such a designer piece can be assured that they are purchasing a quality item sure to appreciate in value. Chopard engagement rings are exquisite creations with eccentric yet timeless style. With a range of gorgeous styles to choose from, couples who opt for Chopard's excellence are sure to enjoy exquisite taste and style with a dramatic yet elegant flair.